"Cézanne made a cylinder out of a bottle. I start from the cylinder to create a special kind of individual object. I make a bottle out of a cylinder." One of Gertrude Stein's favorite artists, and the only Cubist talented enough to make Picasso uncomfortable, Juan Gris built upon the foundations of early Cubism and steered the movement in new directions. A member of the tight-knit circle of avant-garde artists working in Paris, Gris adopted the radically fragmented picture spaces of Pablo Picasso and Georges Braque, imparting to his works a bold, graphic look. Gris's paintings are immediately distinguishable from theirs, informed by his background as an illustrator, with a slick, almost commercial appearance, and crisp design elements throughout. Whereas Picasso and Braque delighted in destroying the conventions of painting, Gris's chief aim was to please the eye. As the artist himself put it, 'I prefer the emotion that corrects the rule'. Despite his radical treatment of the picture space, his well-balanced compositions, saturated colors, and traditional subjects popularized the avant-garde movement. Like Picasso and Braque, he incorporated newsprint and advertisements into his work. Whereas they tended to snip these elements into smithereens, however, he leaves more of the original pieces of ads and newsprint intact, as if to preserve the integrity of the originals. In lifting popular culture into the realm of high art, he is an important forerunner of Dada and Pop artists, among them Marcel Duchamp, Stuart Davis, and Andy Warhol. He was among the visionaries (poets, choreographers, musicians and visual artists) who built pathways among the arts. His costumes for the Ballet Russes show his commitment to interdisciplinary collaboration, an idea that gathered momentum and became central to contemporary art. 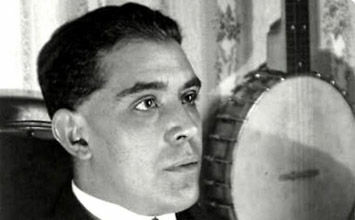 The man who would become Juan Gris, one of the leading figures in Cubist painting, was born José Victoriano Carmelo Carlos González-Pérez in Madrid in 1887. 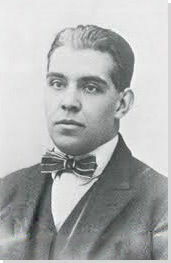 The thirteenth of fourteen children, he attended Madrid's Escuela de Artes y Manufacturas from 1902 to 1904, where he studied mathematics, physics, and mechanical drawing. Though he was a strong student, the rigidity of academic life did not appeal to him, and his natural ability in drawing encouraged him to shift his focus to the study of art. Gris idolized Picasso. A clever tribute to his mentor, his portrait depicts Picasso (founder of Cubism) in the Cubist style. Palette at the ready, Picasso is literally larger than life (taking up most of the space on the canvas). Working primarily in cool hues of blue, gray, and brown, he fractures the sitter's face into a prism of planes and geometric shapes that resolve into the parallel lines in the background. All parts of this picture seem to be in motion. While he and his fellow practitioners produced many more chaotic images, elements of formal portraiture, such as the legibility of the sitter's features, symmetry of the pose, and high-collared jacket (as opposed to a painter's smock), indicate his respect for the subject. It is entirely in keeping with the Cubist mission, however, in its divergence from traditional representation and effort to capture the dynamism of modern life. Around this time, Gris and other Cubists began incorporating collage elements, such as newspaper and wallpaper, into their paintings. Flowers represents a woman's marble-topped vanity table with a vase of roses, a coffee cup, and the morning paper. A tilting oval mirror reflects wallpaper printed with stylized Art Nouveau orchids. Newspaper and wallpaper (literal scraps of everyday life) force us to consider the subject through the lens of modernity. Once owned by the American writer Gertrude Stein, Flowers. Gris was particularly fond of rewarding close viewers with hidden messages. Upon close inspection, we glimpse a second coffee cup and pipe camouflaged by the table - evidence that the lady is not alone. Think of this painting as the masculine compliment to Flowers. Here, a small bistro table with a checked tablecloth almost overflows with an assortment of objects: a bottle of red wine, bunch of grapes, coffee cups, beer bottle, a stout ceramic pot of preserves, coasters, and a French newspaper. Like Flowers, it too contains a hidden message, this time, in reference to his native Spain: a bull's head. The snout is the coffee cup toward the bottom of the canvas, the ear is the bottle of Bass ale to the right, and the "bull's eye" is the black-and-white coaster to the left. It is a poignant reminder that the artist's homeland remained on his mind, though he would never be able to return there. Flagrantly breaking the rules, and combining "low art" (design elements such as the beer bottle logo and newspaper typography) with "high art" (the traditional still life elements), Still Life with Checkered Tablecloth illustrates his brilliance in furthering the goal of Cubism: making something new out of the connections between life and art. A return to traditional values, subjects, and forms is reflected in Gris's work after 1918, and is typical of avant-garde painting in general in the years after World War I. From summer through fall of 1918, he temporarily relocated to Touraine, the countryside region where his wife, Josette, had grown up, and painted peasants in the traditional clothing of the region. Rather than a specific individual, the old peasant in this scene is an archetypal resident of the area. More somber in tone than many of his preceding works in the Synthetic Cubist mode, and simpler, limited to a figure and some objects arranged in two distinct planes, his representation of a farmer expresses a nostalgic mood and a yearning for an enduring, traditional way of life in a chaotic and uncertain time. A favorite of Picasso and other modernists who reexamined traditional sources after the war, Harlequin was a stock character in the commedia dell'arte (a form of masked theater that originated in 16th-century Italy) and a trickster figure with a tendency to act on whim and passion. Harlequin, a time-honored subject in art, appears in approximately 40 of his works produced between 1917 and 1925. Here, his background as an illustrator is visible in the cartoonish eyes and mouth, and the bright graphic lines that trace the figure and its costume. Warm color tones and a familiar subject lend the piece a reassuring stability, undermined somewhat by the slippage in details such as the knotholes, which appear to sliding off the table, and the fingers of Harlequin's right hand, which double as the contour of the guitar. Gris's mysterious painting is of a woman holding a woven basket of vegetables in front of an oval window or mirror. The styling of her hair, face, and clothing recalls Greek and Roman depictions of women, illustrating the renewed interest in classicism and traditional representation of form among European painters after World War I. Like Harlequin and The Man from Touraine, she is a generalized type rather than an individual, perhaps a harvest goddess or an artist's muse. The basket she holds, an element of still-life, recalls his earlier paintings. The hidden message here is less obvious, and yet all the more compelling: the oval behind the figure (either a window or a mirror) is dark, suggesting the approach of death. The piece, one of his strongest and best-known, shows that he remained at the height of his power until the end of his career.